2008 November « Japan, Hockey, Baseball, etc. 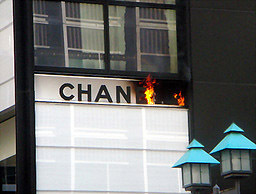 The Ginza Chanel store’s sign caught fire shortly after noon, literally (video). The letter ‘L’ even fell off in a Simpsonsesque moment. Probable cause was the sign being lit up 24 hours a day, apparently. Claude Lemieux out of China? Claude Lemieux‘s brief Asia League adventure with the China Sharks has apparently ended after only 2 games where he recorded 1 assist. 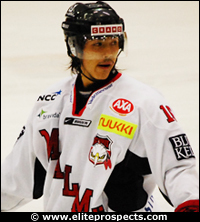 Maybe someone saw that being good enough for an AHL contract, but he’s managed to get himself signed onto an AHL team. I wonder which AHL team? San Jose wouldn’t have sent him all the way to China only for a weekend, I guess Lemieux’s agent kept talking with potential suitors while Lemieux made his way over to Shanghai. Ah well, at least he’s not leaving the Asia League because of living condition issues like goalie Kelly Guard who also played for the China Sharks for only 2 games, last season. Submarine knuckleballer… and it’s a she! This story is full of goodies for the obscure baseball lover. The newly formed Kansai Independent League, which will begin play in 2009, has just held its draft. This is the 3rd independent league in Japan to start operation this decade, after the pioneering Shikoku-Kyushu Island League and the Baseball Challenge League (Hoku-Shinetsu region). The Kansai league features the first female owner of a pro ball club in Japan as the Kobe 9Cruise (yes, that’s the team name) is owned by Kazuyo Hirota who runs a local mineral water company. The league held an open combined tryout on 4 November, and the draft on 16 November where Kobe selected Eri Yoshida, a 16 year old high school girl who is a submarine knuckleball pitcher (got all that? ), with one of its picks after they saw what they liked in the tryout. Yoshida passed the first and second tests of the tryout, then pitched an inning where she struck out the first batter on a knuckler, walked the second batter, then got the next two batters to ground out to second and pop out to short. 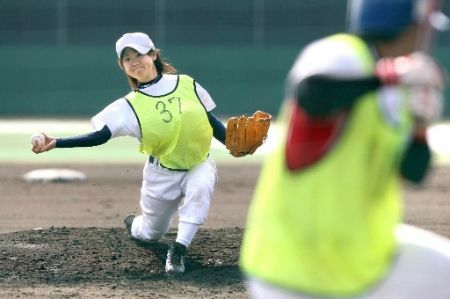 She received a compliment from a former Yomiuri player and new Osaka pitching coach that her knuckler and fastball both have the same delivery. Her fastball is in the high 60s, so I assume she relies almost entirely on the knuckler. 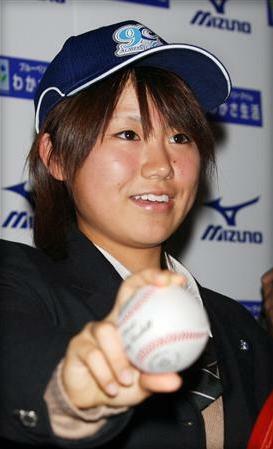 It’s reported that she’s considering transferring to a Kobe high school, and indie games tend to be played on weekends, so I guess this could somehow all work out, it’ll an interesting story to follow as Yoshida becomes the first professional female baseball player in Japan (in a men’s league, there was a women’s league for 2 brief years following the war).